My dad got the book Outcasts United from a friend, and proceeded to procrastinate about reading it. Well, being the voracious reader I am, I picked the book up and decided to read it. For the most part, I was pleasantly surprised. 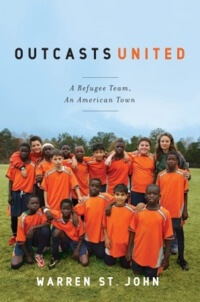 This book tells the story of a youth soccer team, made up of refugees, led by a Jordanian woman, in small-town Georgia, USA. 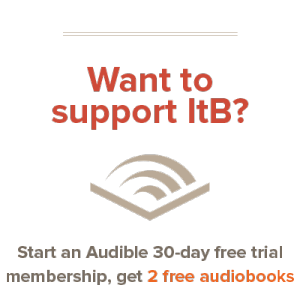 That premise alone attracted me to the book and I wasn’t disappointed. The book begins by telling the story of Luma Mufleh, and gives the first few years of her life in a chapter or two. Luma left her home in Jordan and moved to Georgia, where she began coaching a YMCA team. Disillusioned with the lukewarm enthusiasm from her team at the YMCA, Luma resigned and moved to Clarkston, Georgia, where she had observed many refugees playing pick-up soccer all around town. She eventually began a soccer team called the Fugees. I appreciated the fact that this book didn’t really dwell on the high spots of their journey. Instead, it told the story as Luma coaches: calmly and collectedly, with no greater emphasis on the good than the bad. It tells of Luma’s hard methods for disciplining the kids, including dropping them from the team. It tells of their struggles with the town and its mayor, Lee Swaney. The book tells us how a bunch of refugees with hand-me-down equipment defeated kids with three hundred dollar cleats. This book is heartwarming, and I enjoyed reading it. It’s a great example of the changing diversity in the United States, as we read about Libyans, Afghans, Sudanese and Somalis coming together to play soccer. I would point out one problem, however: in assessing the city’s reaction to the changing and growing diversity, the book mentions conversion to Islam as a favorable aspect of the diversity. This is something I have a problem enough, but it is small enough that I can still recommend the book. If you’re in the mood for a real-life story, a true story, then this is the book for you. It’s about how refugees came together in Clarkston, Georgia, and started a soccer team, and tells that story faithfully, including the hard parts. Warren St. John, who wrote the book, observed the team for over a year and became a part of their families, visiting many of the boy’s families. His inside aspect to the story makes it all the more interesting to me. If you have time to read this book, I’d recommend it to anyone who enjoys non-fiction. Glad you enjoyed it, Tarringo – we try to keep the reviews coming!